The merge is going to air as part of Survivor's next episode on Wednesday night and will allow Kelley a fresh start after being a member of two losing tribes -- Manu before the tribal swap and Lesu after the swap -- who lacked food and physical strength. Kelley has also been a consistent target on both tribes. But in last week's episode, Survivor host Jeff Probst called for a two-tribe Tribal Council, and Kelley's Lesu tribe avoided drawing rocks by convincing "Manu 2.0" to join them in taking out Wendy, who made herself famous on the island by refusing to kill chickens. "That Tribal was absolute chaos," Kelley told Entertainment Weekly in a recent interview. Both tribes arrived at the decision to oust Wendy on a revote after Lesu and Manu 2.0 arrived at a 4-4 tie vote for Kelley's closest ally Lauren O'Connell on Lesu and Wendy on Manu. No one was willing to risk his or her place in the game on chance or luck. "Both sides appeared to be holding steady, but throughout that Tribal there were a couple comments made by the Manu 2.0 members (prior to the initial vote) that made our Lesu group feel like they were willing to cut ties with Wendy," Kelley shared. "I believe there was even one point where [Gavin Whitson] made a comment along the lines of, 'The three of us will come together and vote with you all.' And, as nice as that sounds, you just can't trust someone you've never met before." Kelley continued, "Despite the lovely idea that we might leave that Tribal in a 7-1 initial vote, Lesu wasn't revealing our plan, and in turn, Manu 2.0 had to stick with theirs." After the tie vote, viewers saw Kelley and Lauren run over to the other side to quietly speak with Manu's Gavin and Victoria Baamonde. When EW asked Kelley what was said during that huddle, Kelley replied, "Lauren and I spoke with Gavin and Victoria to confirm we were on the same page with all voting Wendy on the re-vote." "There was also a bit of 'Let's work together come the merge' stuff happening, " she added, "which is to be expected in a situation where two groups are voting together." Had Lesu lost the Immunity Challenge and attended Tribal Council on their own, Kelley revealed David Wright would have been her target. "I would have voted out David. Although [Dan "The Wardog" DaSilva] was targeting my closest ally, Lauren, and irritating the tribe, he and I had been working together on every vote up until that point," Kelly told EW. "I had been trying to work with David as well, but going in to a merge down in numbers, I felt that I needed people who were definitely on my side in order to try and tackle that large Kama group." Little did Kelley know at the time David wanted her out all along. In fact, David had been conspiring with Rick Devens for days to take Kelley out, but timing was never in their favor. "I had a conversation with David very early on at the Manu beach and expressed that I felt returnees should stick together. Throughout my time at Manu, I really felt that David was of the same mindset, and we had a fairly decent working relationship," Kelley said, expressing surprise over David's secret plotting. "We were in on all the same plans the first three votes, so I was quite shocked to hear (in the early episodes) that he was so adamant about voting me out. It seems he had multiple opportunities to pull the trigger, and didn't, so I'm not sure how badly he really wanted me gone." The 31-year-old marketing manager from Ephrata, WA, who currently resides in Seattle, WA, previously appeared on Survivor: San Juan Del Sur and Survivor Cambodia: Second Chance. 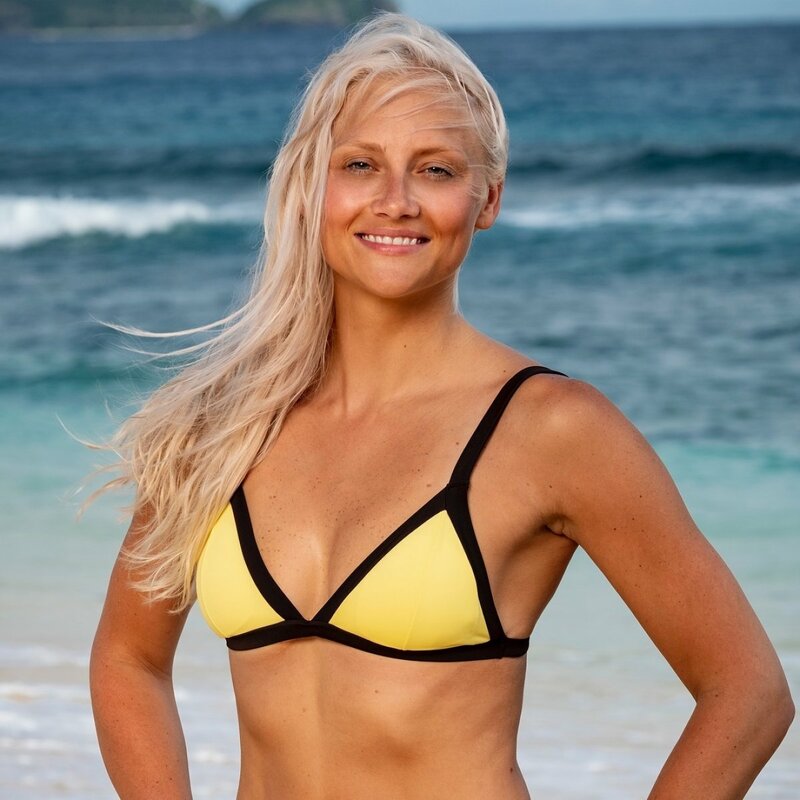 Kelley is one of three returning players left in the original game of Survivor: Edge of Extinction, as Aubry Bracco was voted out of her tribe during the first of last week's two episodes. Aubry, Wendy and the rest of the previously-eliminated castaways on Extinction Island, however, will have the opportunity to potentially rejoin the game, unbeknownst to the other players. Kelley is still fighting for the $1 million grand prize against David, Joe Anglim, and the newbie castaways heading into the next Survivor episode on March 27 at 8PM ET/PT on CBS.